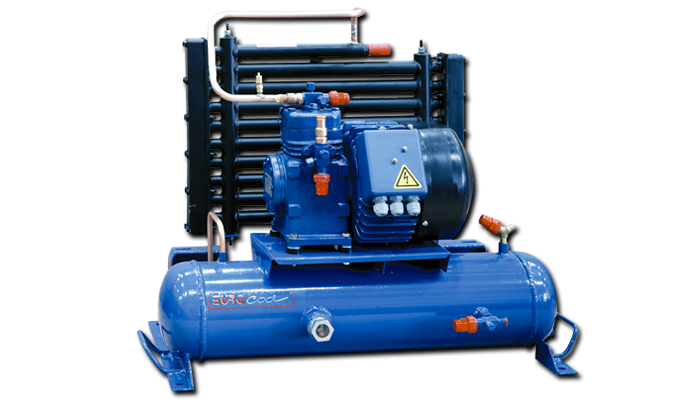 "EURO-COOL" ITC tube in tube water cooled condensing unit feature. Energy efficient Semi Hermetic Compressor. Engineer as a split system. Easy to install. Fully assembly and Factory tested. Above capacity rating based on R-404a, and 31℃ water entering condenser. refrigerant with an evaporating temperature at -25℃ or -5℃, based on the specification. In the package, we also provide a liquid receiver with large reservoir, which its size varies according to type of models. A set of multiple tubes are aligned for heat exchange. Unlike the air conditioning unit, here water is applied for heat rejection by the process of conduction. Also, with the refrigerant, it then causes heat transfer. Hot gas of refrigerant condenses into liquid form with a temperature less than 40℃. The water at 31 ℃ absorbs all heat and yields 40℃. Hence, ITC would like to present you this outstanding Tube-in-Tube Water Cooled Condensing unit you will ever have.